← 131 "Home Sweet Homediddly-Dum-Doodily"
"You traded my soul for pogs?!?" "I am not a lean, mean, spitting machine"
Bart Sells His Soul is the fourth episode of Season 7 and first aired on October 8, 1995. "After perpetrating a prank on the First Church of Springfield, Bart sells his soul to Milhouse for five dollars. Bart comes to regret his decision, and goes on a desperate quest to regain his soul. In the end, he gets it back with the help of an unexpected source." The Simpsons serve as church ushers one Sunday morning. Bart uses the opportunity to switch the intended hymn with a song called "In the Garden of Eden" by "I. Ron Butterfly"; actually, the song is Iron Butterfly's "In-A-Gadda-Da-Vida". Rev. Lovejoy initially fails to notice anything amiss (or the lewd behavior of congregants) but he eventually catches on, noting "This sounds like rock and/or roll". At the end of the 17-minute song, the exhausted organist collapses on the organ. An angry Rev. Lovejoy assembles the children into his office and demands that the culprit identify himself. When Milhouse sees a crow squawk at him menacingly, he immediately rats out Bart. As punishment for his prank, Bart is told to clean the organ pipes... and for being "snitchy", Milhouse is forced to help Bart. Bart blames Milhouse for snitching on him, and when Milhouse says he feared crows pecking at his soul for eternity if he didn't tell, Bart scoffs at the very notion of having a soul, saying there is no such thing. 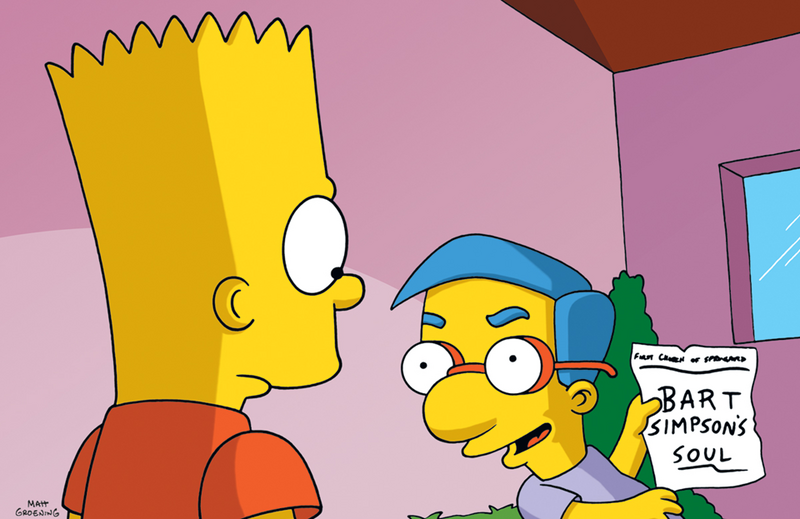 Milhouse calls his bluff, and tells Bart he'd like to buy it (in the form of a piece of paper saying "Bart Simpson's soul") for $5. He then proceeds to say "Anytime, chummmmmmmmmmmmmmp". Lisa tells Bart that he will regret selling his soul, but Bart is still disbelieving. Soon, however, Santa's Little Helper won't play with him, automatic doors fail to open for him, and when he blows on the freezer doors at the Kwik-E-Mart, no condensation forms. Also, he finds Itchy & Scratchy cartoons to no longer be funny (actually he still knows they're funny but he simply can't laugh any longer), to which Lisa quotes "laughter is the language of the soul". Bart begins to suspect he really did lose his soul, and sets out to get it back. He finds Milhouse playing maniacally with the piece of paper. Bart makes several offers to buy back his "soul", but Milhouse refuses each time and jacks up the price. That night, Bart has a nightmare about being the only child in Springfield to not have a soul, and is mocked as a result. Lisa also taunts Bart with a dinnertime prayer, leading him to make a desperate, all-out attempt to get the piece of paper back. In desperation, Bart makes a late-night attempt to retrieve his soul, having to travel across town where Milhouse and his parents are staying with his grandmother. However, the 2 a.m. visit is in vain; Milhouse had traded it to the Comic Book Guy for Alf pogs. A frustrated Bart camps the rest of the night in front of the Android's Dungeon to get his soul back. In the morning, an annoyed Comic Book Guy tells Bart that he does not have said piece of paper anymore, refuses to disclose who he sold it to and tells him to go home. A despondent Bart walks home in the rain, and in his room dejectedly prays to God for his soul. Then, floating down from above is a piece of paper, with the words "Bart Simpson's soul." Lisa had purchased the piece of paper, and while explaining philosophers' opinions on the human soul, Bart maniacally eats it up. That night, he rests easy with the pets curled at his feet. In the subplot, Moe wants to expand his customer base by turning his tavern into a family restaurant called Uncle Moe's Family Feedbag, styled a la T.G.I. Friday's and Applebee's. The gimmick: If he doesn't smile when he hands a customer his check, the meal is free. To cook all of his food, Moe buys an army surplus deep fat fryer which he claims, "will flash fry a live buffalo in 45 seconds." Homer immediately whines, "But, I want it now!" Moe's surly demeanor and the stress of running a family restaurant by himself ultimately unnerve him, and it isn't long before he finally snaps at a little girl (who complains that her ice-cold soft drink "makes [her] teeth hurt"). The restaurant is a resounding failure, forcing Moe to revert the restaurant back into his run-down tavern. The episode was written by Greg Daniels and was directed by Wesley Archer. 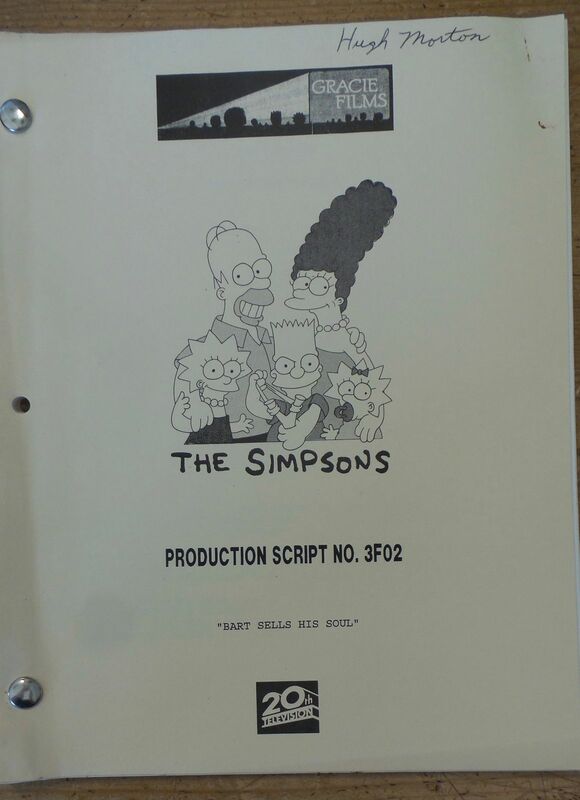 Matt Groening, the creator of the series, listed it as one of his favourite episodes. Wikisimpsons has a collection of images related to "Bart Sells His Soul". The episode is often used by secondary schools in religious education courses as a teaching resource. Modified on July 9, 2017, at 06:46.